A small town of some 3000 people Llangollen is steeped in myth and legend. 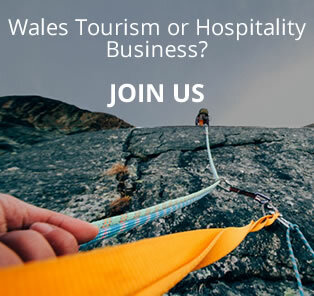 In many ways it is best known for hosting the Llangollen International Musical Eisteddfod every July which brings in some 120,000 visitors and turns the town into a vibrant international stage. A small town of around 3,000 people Llangollen is steeped in myth and legend. 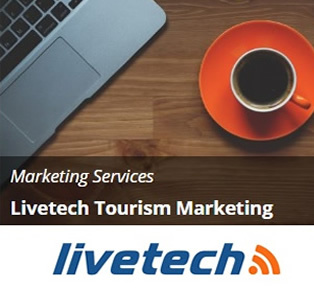 In many ways, it is best known for hosting the Llangollen International Musical Eisteddfod every July which brings in approximately 120,000 visitors and turns the town into a vibrant international stage. As with so many ancient Welsh towns, it takes its name from its founding Saint; Collen, a seventh-century saint. Llangollen, was established in the 7th Century when The monk St. Collen was instructed to find a valley by riding a horse for one day and then stop and mark out a “parish” a place to build his hermitage or cell in the custom of the times, with tiny church, hospice and outhouses all enclosed within a wall. The famous Dee Bridge was built by Bishop Trevor of Trevor Hall in I345. It is a scheduled ancient monument and was widened in the 1960’s to accommodate modern traffic. Up to the I9th century, Llangollen town was located south-east of the bridge around Bridge Street and Church Street, and to the north-west around the old village green, which has now disappeared, but is remembered by such names as ‘Green Lane; and ‘Green Lodge’ which still exist. Nearly all of this densely populated area disappeared to allow the building of the Railway. 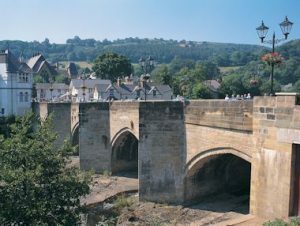 Llangollen became important because of its prominent position on the main London to Holyhead coaching road which was improved by Thomas Telford from 1815 and continued for some 15 years. The Canal was also constructed around this and combined to bring considerable immigration into Llangollen during the early part of the 19th century. These improved communication routes and local natural resources made an ideal location for newly developing industries. The old Water Mill opposite the Railway Station had already functioned for hundreds of years when a new Flannel Mill was erected at the north end of Church Street on a site later to be occupied by a tannery after the business had expanded and moved across the river to Lower Dee Mills. Many objected to this noisy new Flannel Mill. 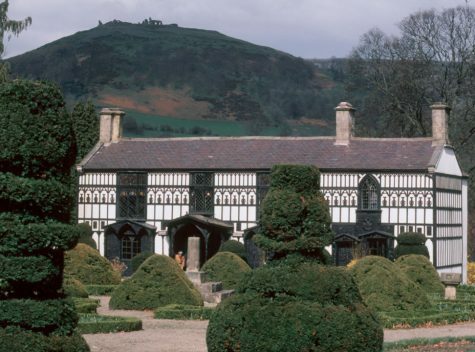 These included Lady Eleanor Butler and the Honourable Sarah Ponsonby, known as the ‘Ladies of Llangollen’ who were able to glower down on `this monstrous building’ from their home Plas Newydd. During this time Plas Newydd was visited by many of the famous and distinguished of the time, although only the favoured were allowed admission. 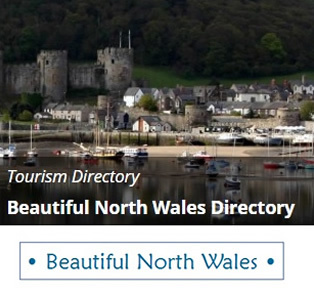 Today the house receives thousands of visitors each year as one of Wales’ most famous tourist attractions. buildings in the 14th century. 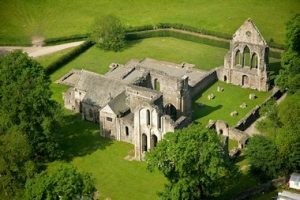 It was largely destroyed during the reign of Henry VIII. 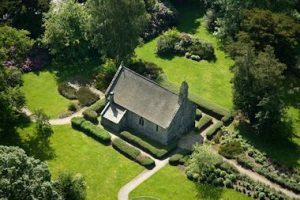 The Rug Chapel and Llangar Church can be found in Corwen, some 10 miles from Llangollen, these beautiful religious sites are well worth a visit. The church retains many ancient features including 15th-century wall paintings while the Rug Chapel is a fine example of a private 17th-century chapel. 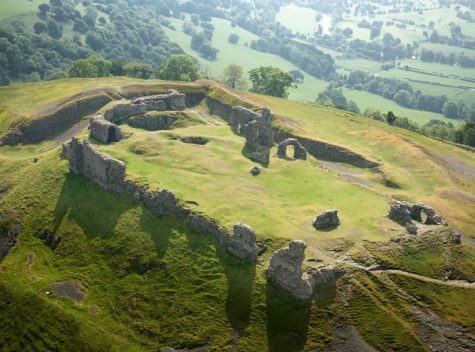 The remains of Castell Dinas Bran (Crow Castle) can be seen high on an isolated hill above Llangollen and reached by a steep climb. From the top the views of Llangollen and the Dee Valley are stunning. 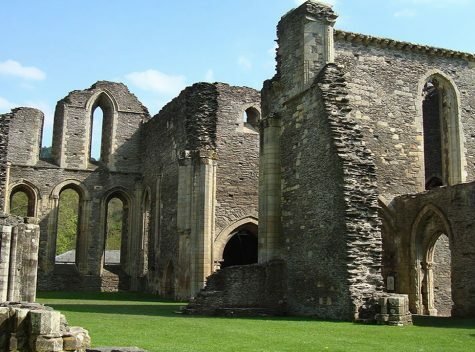 This was said to be the possible burial site of the Holy Grail of the Arthurian legends and was known to have been the 13th Century home of Madoc ap Gruffydd Maelor, the founder of Valle Crucis Abbey and it was possibly a stronghold for Eliseg, Prince of Powys in the 6th Century. Llangollen is a haven for shoppers looking for interesting and unusual gifts. There are also many interesting walks in the town. The canal from the town to the Chain Bridge Hotel and Horseshoe Falls as an example. Another walk is Bishops Walk from the Bridge End Hotel side of the river bridge along the riverside past the old mill sluice gates and leet and the remains of the weir, then past views of St. Collens church over the river, and on to the Sarah Ponsonby Inn. A favourite walk is the town side of the bridge stroll along Dee Lane and Victoria Promenade to Riverside Walk. This passes gardens with views of the steam trains, ducks, a bandstand, tennis courts, bowling green and children’s play area. The town has become a Mecca for amateur theatre productions with thriving societies producing high-class plays, musicals, operas, cabaret and concerts. There are over one hundred groups with a multitude of different interests in the immediate locality, we are all spoiled for choice. Thousands of visitors from around the globe descend on Llangollen in July each year when it hosts the Llangollen International Musical Eisteddfod. 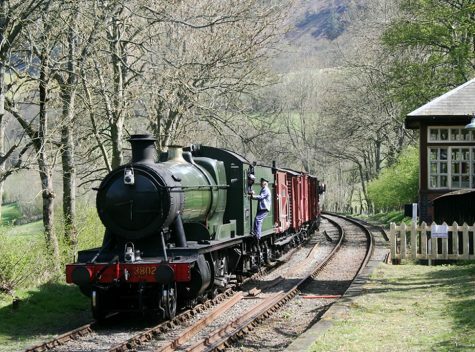 Opened in 1862 the Ruabon to Barmouth railway steamed its way through the Welsh countryside. At one time it was possible to board at Llangollen Station and travel to London without a single change! the Railway closed to passenger traffic in 1965, and to goods in 1968 and over the next seven years Nature closed in on the buildings and track bed. 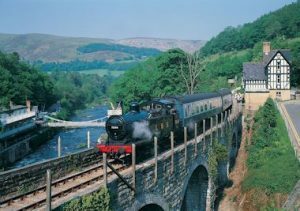 However, steam trains are once more to be seen in Llangollen Station thanks to the efforts of the Llangollen Railway Society. A group was formed to renovate and reopen part of the line in September 1975, with just 60 feet of track which has now grown some 7½ miles along the Dee Valley passing wonderful scenery and giving a glimpse of how this 65-mile journey must have looked like in its heydey. Trains operate during weekends virtually all year and daily from June to the end of October. During the summer, steam trains are mostly used. 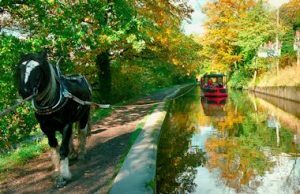 From Llangollen Wharf you can embark on a 45-minute horse drawn trip or a two hour trip on the traditional Canal narrow boat, which takes you through the Vale of Llangollen and across the Britain’s biggest aqueduct at Trevor. 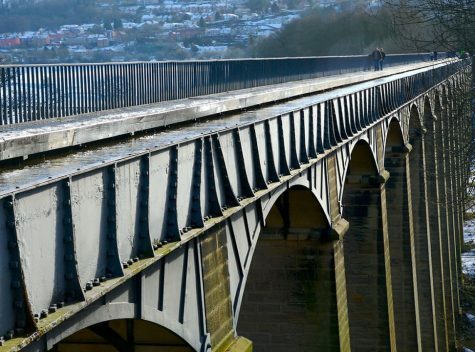 Towering 126 feet above the river and built by Thomas Telford it is a masterpiece of engineering. You will not be the first to experience this. 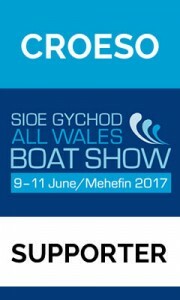 For over 100 years, pleasure boats have operated from Llangollen Wharf – and the experience is as popular as ever. Most of the fishing in and around Llangollen Town is owned by Llangollen Angling Association. No permit holder may fish with out being in possession of a valid Environment Agency rod licence which can be purchased from any Post Office in England and Wales. 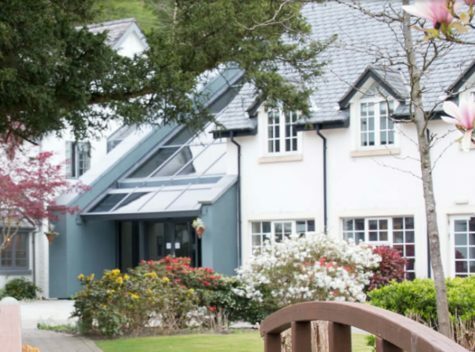 The Association has 14 miles (22.53km) of fishing in and around the town with all waters above the Chain Bridge Hotel being strictly fly only for Trout, but spinning and bait fishing is allowed for Salmon. Worm fishing is allowed below the Chain Bridge Hotel for Trout, Grayling and Coarse fish between the l6th of June and the 3rd of March. No spinning, maggots or any other baits are allowed and keep nets are banned. A bag limit of 4 fish per day applies which can be made up from either Brown Trout, Rainbow Trout, or Grayling. All Salmon fishing to Environment Agency bylaws on the use of baits etc. Worlds End and The Panorama, a spectacular and dominating outcrop of Carboniferous Limestone from Worlds End and Eglwyseg to Trevor is stunning. Great outcrops of limestone providing walkers and climbers with ample scope to escape civilisation for a while. You can also drive along the single track toad and park up – take a picnic for a wonderful peaceful day out. The frost eroded limestone is littered with coral and sea shell fossils confirming this raised mountain was once below sea level. The Panorama road hosts a monument to I.D. Hooson, the noted Welsh poet from Rhosllanerchrugog, a proud local village which was once the largest village in Wales. 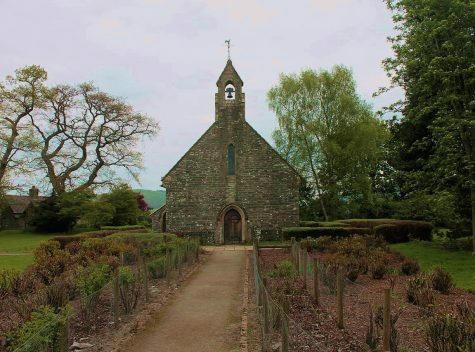 It is still famous for its choirs and is proud of their nickname of ‘Jacos’ – so called because there was great support in my home village for the Jacobite cause. 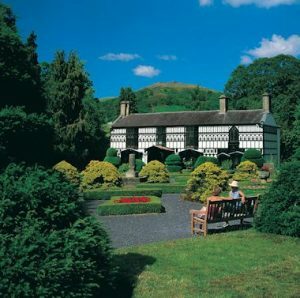 The views from the Panorama are stunning and extended to the Shropshire and Cheshire plains. It is well worth visiting. Plas Newydd was home to the Ladies of Llangollen, Lady Eleanor Butler and Miss Sarah Ponsonby, from 1780 – 1829. They became famous throughout the country and entertained many Regency Society The house still retains the Gothic features they introduced and receives thousands of visitors each year as one of Wales’ most famous tourist attractions. The gardens surrounding the house are worth visiting and offer an excellent view of the local Castle perched high a top a nearby mountain. Visit St Collen’s Church with its carved oak ceiling and after which the town is named.